I have long wanted to recreate the delicious Iskender Kebab, Iskender Kebabi at home; thin slices of lamb or beef in tomato based sauce, served over pide bread with yoghurt and grilled vegetables by the side. 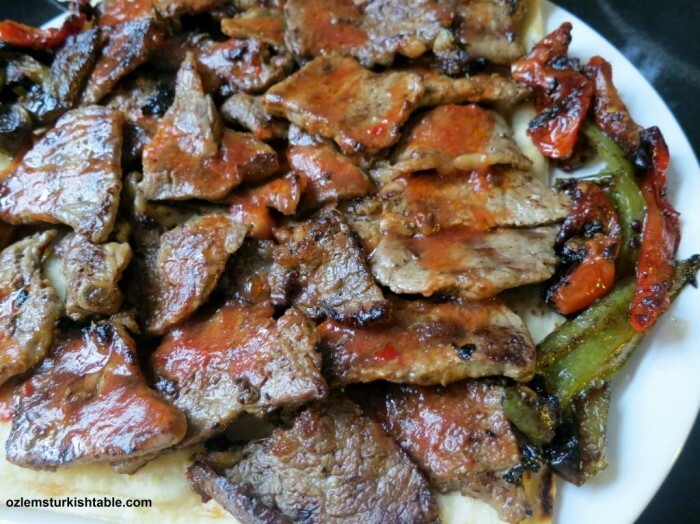 It is one of the most delicious kebabs you can have in Turkey and it is a joy to be able to recreate at home. Living abroad, Iskender Kebab is one of the special treats I dearly miss. 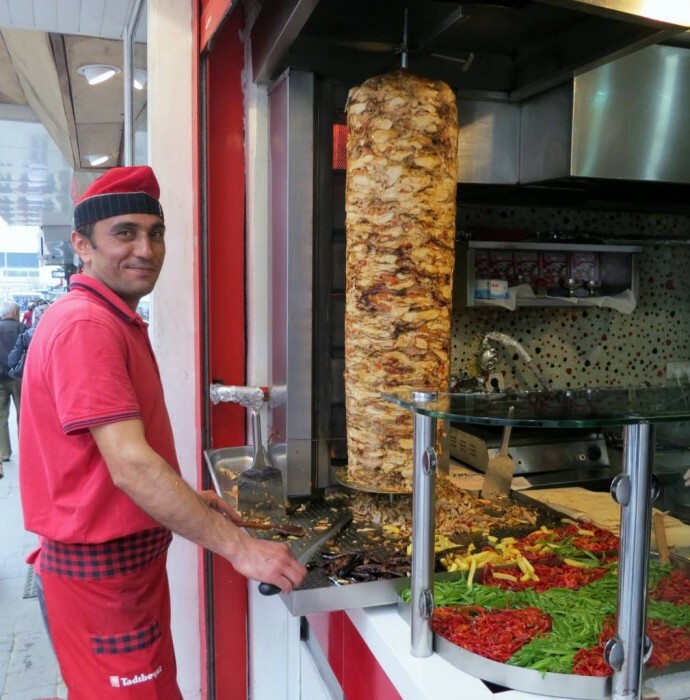 This delicious kebab is a specialty of Bursa region in Turkey and I remember many foodie trips I made to Bursa to enjoy the genuine Iskender Kebap. Iskender Kebab is made with doner kebab, which requires a vertical rotisserie where layers of thinly sliced lamb, beef, veal – or chicken – stacked together. Traditionally, minced meat is used to stick the slices of the meat. Home made Iskender Kebab; easier than you think and most delicious. I don’t have a vertical rotisserie but managed to make a very close by Iskender Kebab at home, greatly enjoyed by family and friends. Thin slices of rib eye steak or lamb or beef tenderloin work very well here. Marinating the meat in onion juice, olive oil and spices is really worth the effort to tenderize the meat and add a lot of flavor. With pide bread, pide ekmek as a base, delicious tomato sauce poured over the meat, grilled tomatoes, peppers and yoghurt by the side, home style Iskender Kebab makes a very special meal to share with family and friends. My thanks goes to the brilliant book Anatolia; Adventures in Turkish Cooking, for the inspiration to have a go at making Iskender Kebab at home. 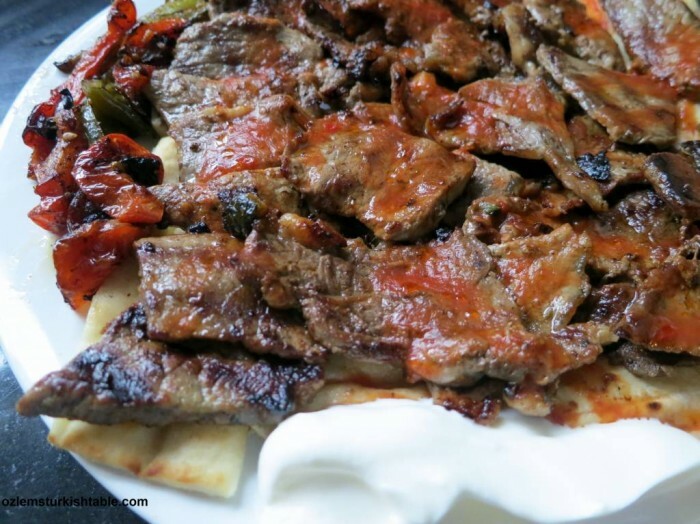 Home style Iskender Kebab; delicious over pita bread with yoghurt and grilled vegetables aside. 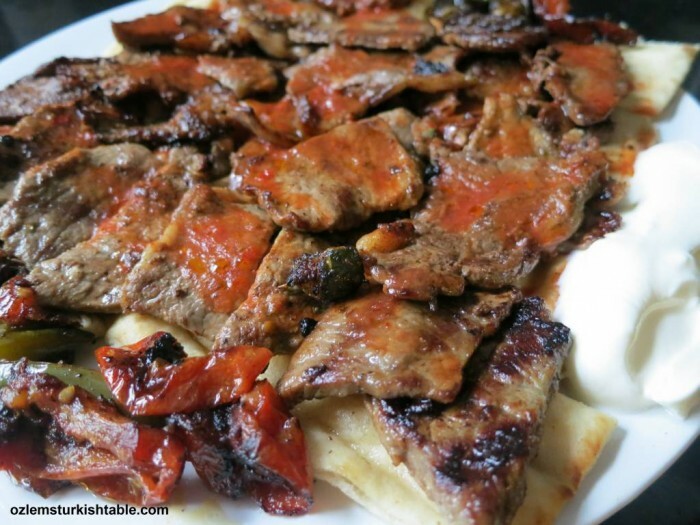 I hope you enjoy making Iskender Kebab at home with my recipe, it is easier than you think and most delicious. My best wishes to you all for the festive season and the New Year, in good health and happiness. Ah yes. Thanks to your post, I’m remembering the wonderful Iskender kebab we enjoyed in Bursa, each time we visited. It is not to be missed. I think some of the chefs also pour melted butter over the whole pile at the end! (I think that’s going a bit far.) But it is truly scrumptious. Thanks for the recipe and the memories. Çoook öpüyoruz, sevgilerimizle, xoxo J. That sounds SO good. I love the idea of using onion juice – I must try that. (I might take the processor into the garden in an attempt to avoid too many tears!) I think I’d probably omit the melted butter too, although, now I’ve heard about it, I’m very tempted. My mouth was watering as I read this delicious recipe. I like the idea of using onion juice as tenderizer. In many Indian kebab, we use papaya juice for tenderizing too, not very easy to find the US. 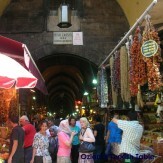 Lovely kebab, Ozlem, a must try. xxPeri. By coincidence we met with friends in Burdur yesterday and we all, children included, chose Iskender kebabı. It was the right choice – tender and succulent with all the additions. Now we have a soba with oven, any suggestions for recipes? 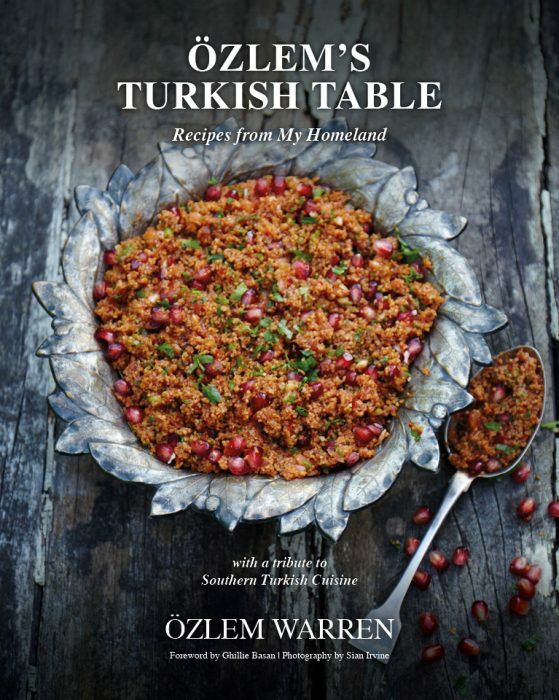 Ozlem hanim – I live in Turkey but want to make this at home anyway. What cut of meat should I ask for from the butcher? Any special way to cut it? Delicious, looks much better than the Iskender we get here. Looking forward to cooking this tonight – the meat is in the fridge marinating now! 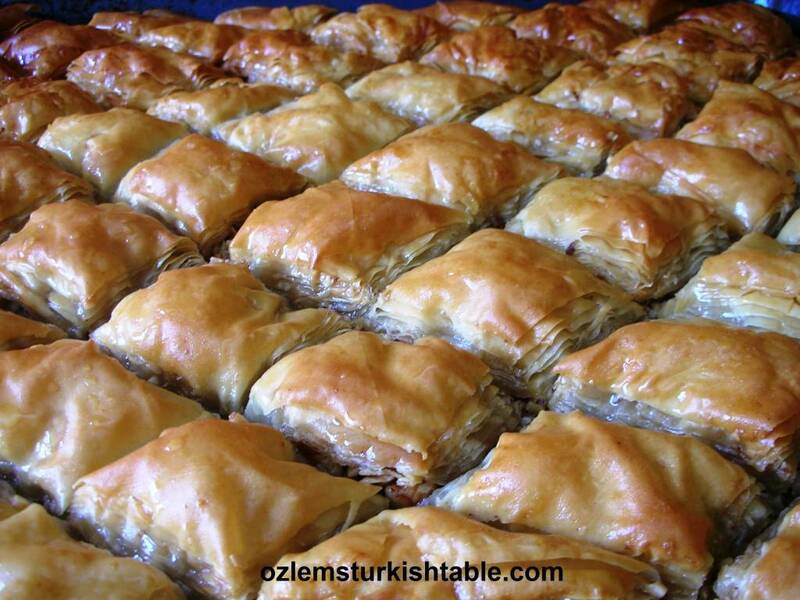 Dear Ozlem, I remember being in a Turkish restaurant years ago. I still talk about the amazing chicken dish I had there, and I would love to recreate it at home. It was called PILIC special, marinated chicken breast thinly sliced,, a tomato garlic and yoghurt based sauce to cover, with a case of pitta on the plate and topped with a butter sauce. 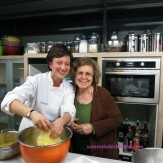 This recipe you share here is similar. Can you help? Thank you, Fiona. Iskender Kebab is one of my favorite Turkish dishes. Nothing like going to kebab house and having Iskender Kebab and finishing with Kunufe!!!! Made this tonight. Simply delicious! Thanks for sharing! Delighted to hear it Cindy, afiyet olsun! Made this last week and my husband loved it so much has asked me to make it again tonight. Simple yet absolutely delicious! Several years ago while in the US Airforce I was temporarily assigned to Incirlik Air Base outside of Adana. Right out if the main gate in what was referred to as “The Alley” were tons of shops, bars, and restaurants. In one of those restaurants we ate at was a dish that consisted of grilled lamb chops over stewed tomatoes and rice. Any idea what this dish is called and where I might find a recipe. I LOVED that dish, and for the life of me I can not remember what it was called. Please someone help! We were introduced to Iskender Kabab at a wonderful Turkish Restaurant in Burlington, Vermont. We have a hard time ordering anything else when we go there. Even though we just had it yesterday, our mouths still cry out for more! So imagine our excitement when we found your recipe online. Thank you so much for the detailed recipe and great pictures!! We know what we will be cooking this weekend. Merhaba Sharon and Jim, many thanks for your kind note – do hope you enjoy making your own Iskender, Afiyet Olsun! I made this yesterday for a dinner guests and it was fantastic. I made a few small changes; the tomato sauce was very thin so I gradually mixed in yogurt stabilised with some cornflour. I’d also used half a roasted red capsicum blitzed in a blender in lieu of red pepper paste. Got a beautiful deep red creamy sauce. I also oven roasted the veggies to save space on the hob. The meat was sensational and I only had it marinating for 6 hours as I was limited for time. Well worth the effort (and tears) with the onion juice. I’ll definitely be making this again! Thank you! 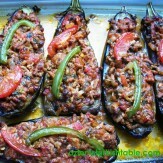 Ozlem I just made this recipe tonight and my husband who is Turkish loved it. He was shocked that it tasted authentic! I have water Iskender many times at home and in Turkey and for some reason I prefer this one! Thank u so much for posting this recipe! Teşekkür ederim Ozlem. Iskender was the first Turkish dish I ever ate and I ordered it right after I arrived in Bandirma in 1999. I lived in Erdek and commuted to Bandirma for work for a couple of months. Iskender was a regular meal for me. This is a delicious recipe!